The white-nosed coati (Nasua narica) is a species of coati and a member of the family Procyonidae, which also includes other coatis, raccoons, olingos, and kinkajous. Local names include Pizote, Coatimundi, and Tejón. It averages about 9-15 pounds in weight, but males are much larger than females, and small females weigh as little as 6 pounds and large males as much as 30 pounds. On average, their total length is about 45 inches, about half of that being the tail length. They are omnivores, preferring small vertebrates, fruits, carrion, insects, and eggs. They can climb trees easily, where the tail is used for balance, but they are most often on the ground foraging. Their predators include boas, raptors, and feral dogs. They readily adapt to human presence and like raccoons, they will raid trash receptacles. They can be domesticated easily, and are quite intelligent. They are primarily diurnal, retiring during the night to a specific tree and descending at dawn to begin their daily search for food. Adult males are solitary, but females and sexually immature males form social groups. They use many vocal signals to communicate with one another, and also spend time grooming themselves and each other with their teeth and claws. During foraging times, the young cubs are left with a pair of babysitters, similar to Meerkats. The white-nosed coati is commonly found on the Yucatan peninsula and many other parts of Mexico and Central America, but is not native to Cozumel. The only White-nosed Coati on the island were brought over from the mainland as pets. The coatis found in the wild in Cozumel are the Cozumel Island Coati (Nasua nelsoni) which is endemic to Cozumel. 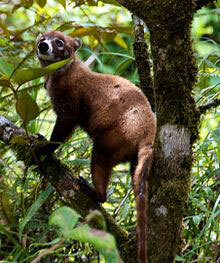 Although very similar to the White-nosed Coati, it has shorter, softer fur and is much smaller. It feeds on fruit and preys upon insects, and small vertebrates. Despite likely having been introduced to Cozumel by the Mayans, most authorities recognize it as a valid species. The Cozumel Coati was very common on the island during the pre-Columbian period and was used by the Mayans both as a food source as well as pets. Up until 15 or 20 years ago they were still plentiful, but their numbers have drastically declined since then and they are now a rare sight. A small troop can occasionally be seen at San Gervasio, however.